Thank you to G. Russell Case for being the Beaux Arts 2018 Signature Artist. Western painter G. Russell Case is inspired by nature, but he places little value on literal translations. His sweeping, idealized versions of the western landscape are compositions that combine the beauty of the natural world with the rich imagination and originality of an artist’s mind. While there is an unmistakable honesty present in his painted environments — stemming from his engagement with the land painted directly from nature — viewers may be reminded of other great artists of the west, whose work is marked by distinctive artistic philosophies. Case’s work is unfettered by philosophy and intellect, though he is surely a student of his artistic forebears. The monumental scale of Maynard Dixon, or the unfiltered color and light of Thomas Moran both find their way into his visual language. Yet Case’s work is simple, pure, and fresh; his painting draws in the viewer and delivers timeless landscapes. We are immediately transported into a world created by shadow and light, of immense vistas punctuated by jagged mountains and inhabited by lonesome cowboys. Russell’s work is represented in many galleries including: Jackson, WY; in Salt Lake City, UT; in Mt. Carmel, UT; in Santa Fe; and in Scottsdale, AZ, in Ketchum, ID; , Culver City, California; and in Billings, MT. 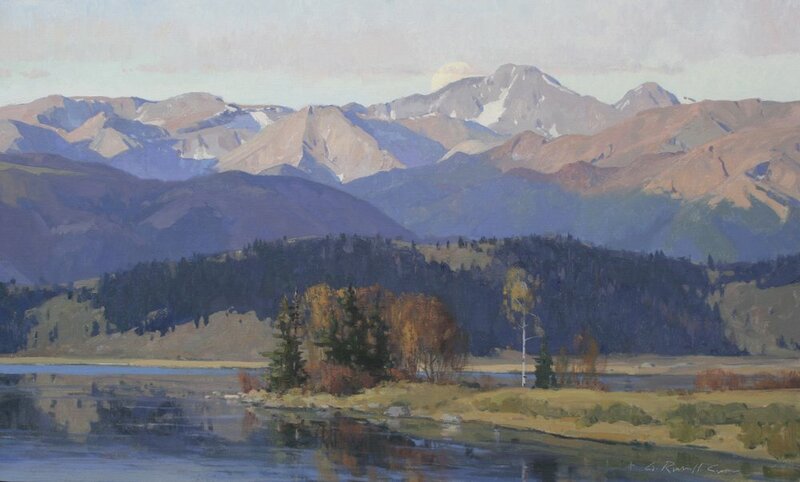 Case has also won numerous awards including Best of Show and First Place Oil Painting, Phippen Western Art Show in Prescott, Arizona in 2001; First Place at Southwest Magazine Artist to Watch Show in Steam Boat Springs, Colorado in 2002; Best of Show, People’s Choice, and Artist’s Choice, Maynard Dixon Country, Mt. Carmel Junction, Utah in 2003; 2004 brought him the Golden Thunderbird Award for Best of Show at the Maynard Dixon Country exhibition. In 2005 Russell won the Edith Hamlin award at the Maynard Dixon Country. Coors Show featured artist 2010; and 2010 Dixie Invitational 3rd Place Oil. In 2012 he was awarded Best of Show at the Coors Western Art Exhibition & Sale. Russell received Artist Choice award at the Coors Show 2015. National shows Case is in are the Prix de West in Oklahoma City, OK; Western Visions shows in Jackson, WY; Coors Western Art Exhibition, Denver, CO.; and Maynard Dixon Country, Mt. Carmel. To purchase a G. Russell Case piece visit http://www.russellcase.com.